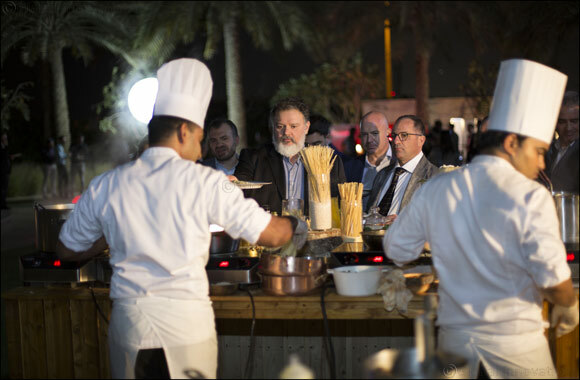 UAE, Dubai, 21 February 2019: The Italian Trade Agency in cooperation with Fiera Milano held The TuttoFood Event (TUTTOFOOD is an Italian word which means All Foods), at the Four Seasons Resort Jumeirah yesterday evening. The special event was held to promote the TuttoFood Exhibiton, one of the most important food fairs taking place in Milan later this year between 6 and 9 May 2019. Italian exhibitors participating at Gulfood this week, together with local importers and distributors, were hosted at the dinner, in the presence of Mrs. Valentina Setta, Italian Consul General in Dubai alongside Mr. Gianpaolo Bruno, Italian Trade Commissioner to the UAE, Oman and Pakistan. TuttoFood is an international B2B show dedicated to food & beverage is held every two years in Milan. This year, over 1,800 companies from over 40 countries will be participating. The exhibition attracts thousands of visitors with 85,000 plus from 140 countries expected to attend the four-day event in May.